Immunotherapies targeting CTLA-4 and PD-1 have recently garnered a lot of well-deserved press, as they continue to radically improve the outcomes of patients with cancer. Keytruda, Opdivo, and Yervoy are now all FDA approved across several tumor types and are being actively explored in many more indications. 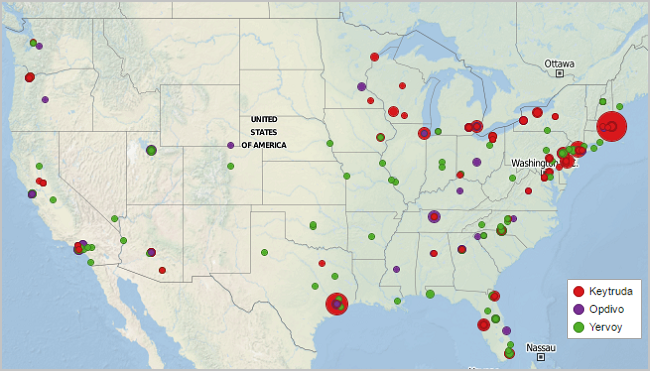 Using the MDDetails platform, we have mapped more than 140 clinical research sites for these agents by tracking research payments made to investigators and organizations. A summary of this activity is highlighted in the map below. Companies looking to develop the next wave of checkpoint inhibitors (e.g., Roche, AZ) would be wise to identify / engage with emerging research sites and centers of excellence. How we can help: MDDetails tracks research activity across nearly every therapeutic area and can provide a detailed characterization of established and emerging investigators/research centers.